Natural beauty is in abundance and accessible via indigenous plant-lined trails, nature sanctuaries and natural wonders of our protected national parks — no visit to Virgin Gorda is complete without a visit to the world famous “Baths.” And if you love beaches, make sure to visit Savannah Bay, regularly ranked among the Caribbean’s best. To stretch your legs, hike to the island’s high point, Gorda Peak, for a splendid panoramic view of the surrounding islands. Or climb to “Drake’s Lookout” at BEYC, overlooking Eustatia Sound and North Sound. Evidence of the rich heritage of African, Indian, English and Spanish history is plentiful, from the Spanish ruins at Little Fort National Park to the Cornish Copper Mines, where the old foundations are set against the azure sea at the island’s southwestern tip. Don’t miss the trip to Spanish Town to sample Virgin Gorda’s local cuisine and culture. North Sound, where BEYC is located, is considered among the best deep-water anchorages in the Caribbean, if not the world. Protected all around by islets and reefs, North Sound is a microcosm of the BVI, featuring great snorkeling spots, beautiful beaches, and a vibrant yachting community. Seafarers have been visiting North Sound dating back hundreds of years, including Sir Francis Drake and Sir John Hawkins. 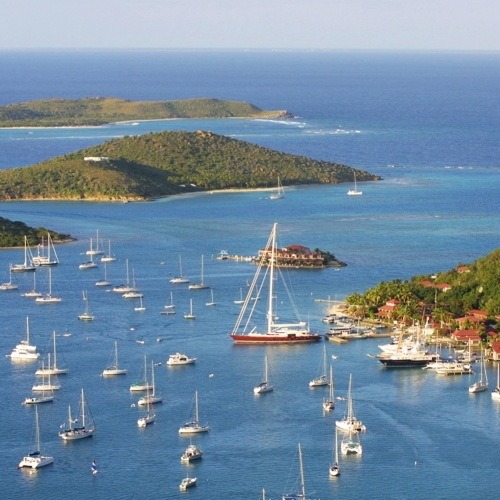 For more information on Virgin Gorda and the BVI, click here.